Do you know pigs can even create art? Pinto, a Yucatan Miniature pig at Brookfield Zoo near Chicago, USA, is known for his strength and ability to learn quickly. He is also a local star who attracts many to his daily show of tricks, similar to those a dog might do. Pinto is even a professional artist! 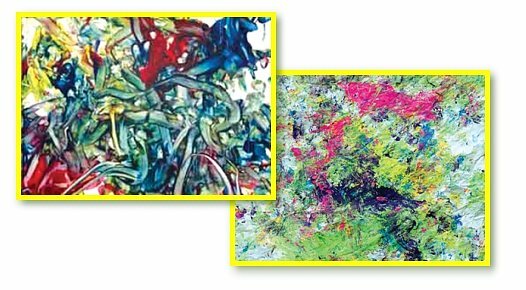 In order to raise money for the Brookfield Zoo’s animals and conservation program, Pinto’s artwork has been auctioned off on E-bay. into’s method of painting is very curious. He is given non-toxic primary colored paint and then he proceeds to blend and mix the colors himself using his snout and hooves. Sometimes he takes advantage of odd objects lying around or even his own food to create his masterpieces. This just goes to show you that our animal friends do have creative potential and are able to express it if given simple tools. Pinto’s paintings look quite modern. Painting isn’t just for people. 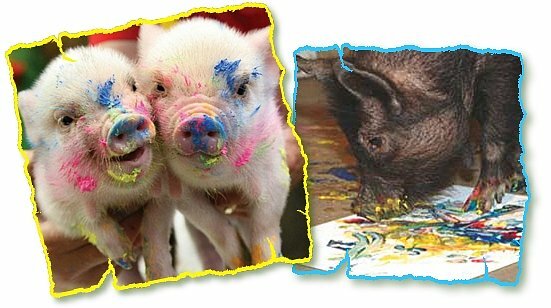 These pigs are painters too! On the other side of the globe, pigs Rodney and Del Boy, at Pennywell Farm in Buckfastleigh, Devon, England, are painters too. This all started by accident when the pigs broke loose and snooped their way insto some open cans of paint. Their works of art are comparable to many modern art pieces.